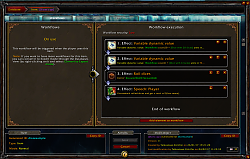 This add-on is an extension for Total RP 3, version 1.2.0 and above. Please make sure to always have the latest version of Total RP 3 installed. Check out our YouTube channel for video tutorials on how to get started with Total RP 3: Extended! 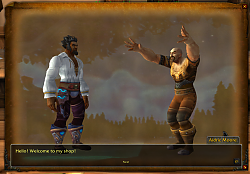 World of Warcraft has a strong community of players with a lot of talent when it comes to role-playing, fan-fiction, and other artistic creations. One major problem is that all these original creations can only live outside of the game as we can't have any impact on the game itself. Total RP 3 Extended is aiming to change this. Total RP 3 brought you the best way to customize your characters and companions (pets and mounts). 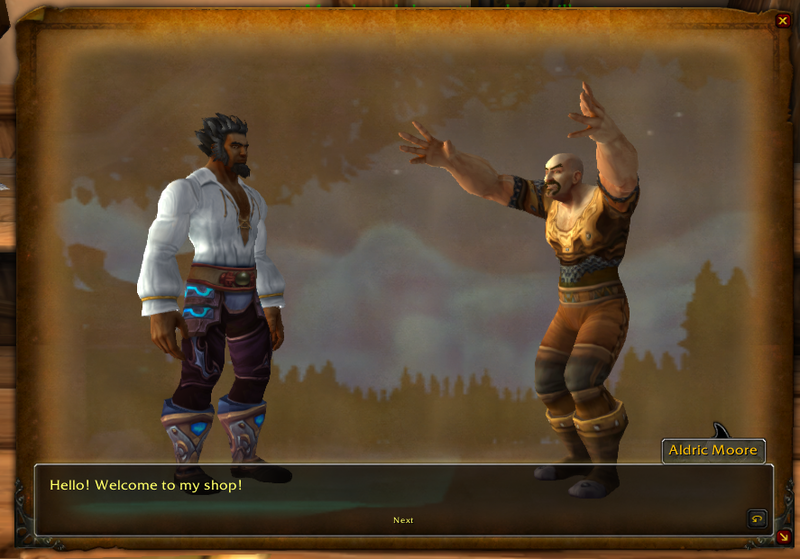 Total RP 3: Extended brings you the best way to create new content in World of Warcraft: campaigns with quests, customized NPCs and dialogues, items, documents (books, signs, contracts ...) and much more! Place items on the ground to get them back later or place them in stashes that other players will be able to find and open. 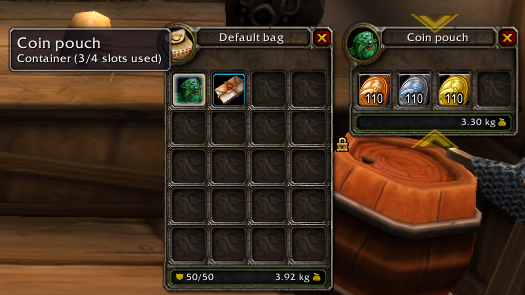 Total RP 3: Extended gives you a brand new*RP inventory to place items on your character visually. 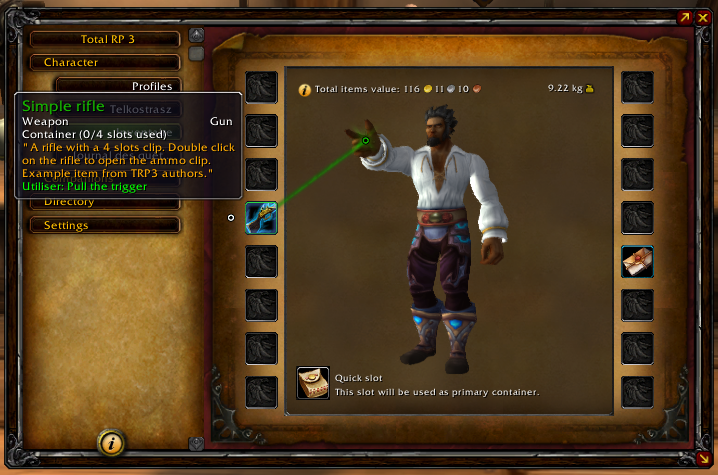 People with Total RP 3: Extend will be able to see the items you are wearing and you can inspect them too. Create rich campaigns with multiple quests and steps, customize in-game NPCs to fit your needs and create immersive 3D dialogs with multiple choices. This is a separated add-on, we don't "force" any Total RP 3 user to use it. That was a reason why Total RP 2 was considered really heavy for casual roleplayers. If you want Total RP 3: Extended, just get it in addition of Total RP 3. But Total RP 3 alone will stay lightweight. The interface is clean, pretty and easy to handle. We provide different levels of complexity for the editors' interfaces (Quick / Normal / Expert). So you will have a simple UI to quickly create simple items, but when you are ready to go to the next level and have the full unchained experience, you can use the tool in "expert mode". All these concepts will bring this addon to the saying "Easy to learn, hard to master". The add-on is separated in two sub-add-ons. One contains the inventory management and a roleplay quest log. 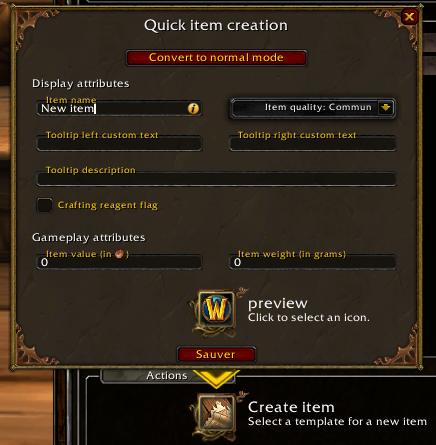 The other contains all the creation tools to create your items and quests. Fixed an issue with the download progress display while inspecting or exchanging an item. This update requires Total RP 3 version 1.5.0 or higher. Map scans for stashes and dropped items have been re-implemented for the new world map system. You can now right-click on your own stashes when using the "Scan for my stashes" scan to edit or delete them. Thanks to the new map system in Total RP 3's core add-on, stashes and items placed on a specific level of a map will now correctly be associated to that specific level only. 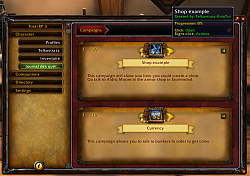 A new effect has been added to allow you to execute a macro when using your Total RP 3: Extended items. You can run macro commands from the game (/use, /cast, /roar, /equipset, /petfollow, etc.) or any command added by an add-on (/dbm pull, /skada reset). The macro executed can even resolve TRP3:E variables from your workflow, to inject variable values inside the execution. This effect will be completely ignored while in combat. This effect ignores delays. 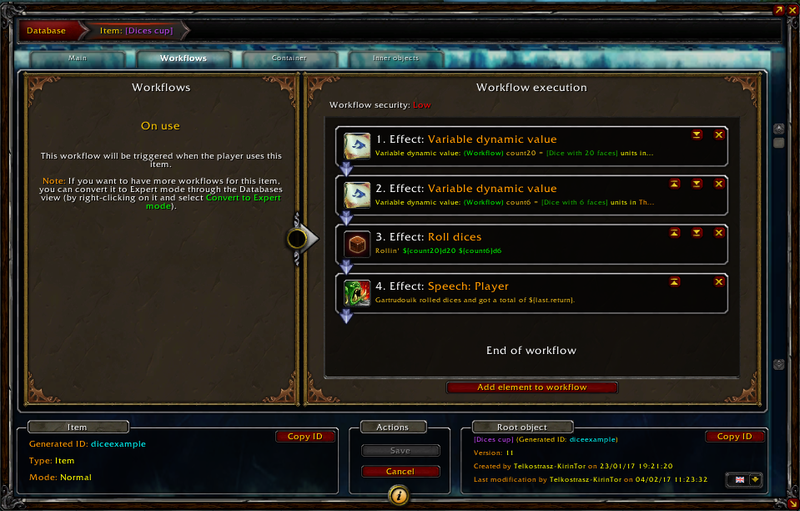 The generated macro commands from your workflow effects are compiled when the item is used and executed immediately. This effect will only be executed when an item is right-clicked from the inventory by the player (it can be a workflow called by an item being used). It will be ignored if called by a campaign event or a cutscene. (Support for cutscene dialog buttons will be added in an update). Due to the dangerous nature of allowing access to commands like /use, /gquit or /script, this effect's security is set to "dangerous" and requires manual approval when receiving an item using such effect via trade or imports. Creations exported using the quick export feature are using a new algorithm that combines both compression and safer encoding. Basically, this means you are able to export bigger creations faster and the serialized text is no longer using characters that might be transformed by word processors. This new format will only be compatible with versions 1.3.0 or above. Note: The website http://wago.io for sharing Total RP 3 creations has received an update to support this new algorithm (thanks to Ora from the wago team) and will be able to import the new export strings while exporting export strings compatible with both pre and post 1.3.0 versions of Total RP 3: Extended. Fixed sound and music broadcasting to other players. Fixed an issue in the migration to 8.0's new map IDs in drops that would cause them to not be shown on the map. Fixed an issue that could cause some effects to have invalid arguments when leaving the effect editors without confirming. Fixed an issue when trying to split stacks following the release of patch 8.1. Fixed the maximum amount when splitting a stack to prevent issues when splitting a stack by its entire amount. We actually had the same kind of feedback on Curse a while ago and I updated the description there a few weeks ago (but I forgot to update the project it here because Wowinterface is losi— err… nothing, scratch that). I have updated the description here to reflect the one on Curse. Thanks for the constructive feedback. "Even if World of Warcraft is losing subscribers month after month, it still has a strong community"
"Irrespective of subscriber numbers, World of Warcraft has managed to maintain a strong community"
Opening up with a negative doesn't help your cause. I'd choose the first or second of those three options.